Welcome STYLE GRANDE readers! d'you get it my names Grandy and the blogs called Grande. As you can see i've completely revamped my blog. Why you ask? well there are a few reasons, the first being having a blog url which was 11 syllables long was quite a verbal treck and simply aint nobody had time for that. After on several occasions being awarded with blank glances after triumphantly answering the question 'so whats your blog called?' Because as soon as i'd said 'Ohsofashionxo.blogspot.com' they had already forgotten what the heck I'd uttered only 1 second prior. I knew something had to change. The second being i'm no longer 14 years old and to be truthful Ohsofashionxo doesn't really have the same ring to it that It had in the winter of 2011 when I first started this little bad boy. Though in saying all that my time with Ohsofashionxo has been amazing and though its gone it will live on forever through STYLE GRANDE as we move on to bigger and better things! Aha. I hope you love the banner as much as I do, right now its featuring my 'i-want-it-so-bad-but-can't-have' item for this season which is the Mary Kantrantzou (yes we all know I'm obsessed with her) Coraline Jumper for Resort 2014. Its it a beauty. 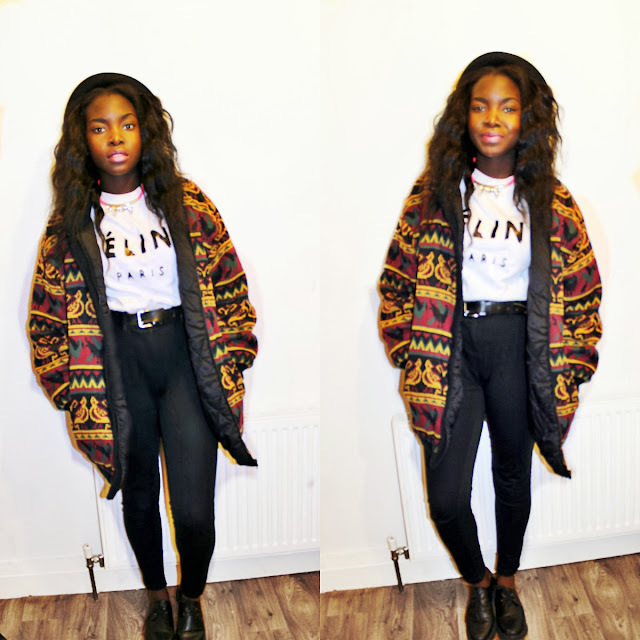 The pic above is a super quick OOTD showing my fave college look of the week featuring my Dads jacket from the 80's! Talk about Genuine Vintage. Those who know my blog know I love everything that was manufactured not in this era that has been worn and kept nicely enough that It still survives today. And this is definately one of those pieces I adore. I will be wearing this constantly during these winter months as it's just jolly marvelous for layering. Love the jacket on you!! !